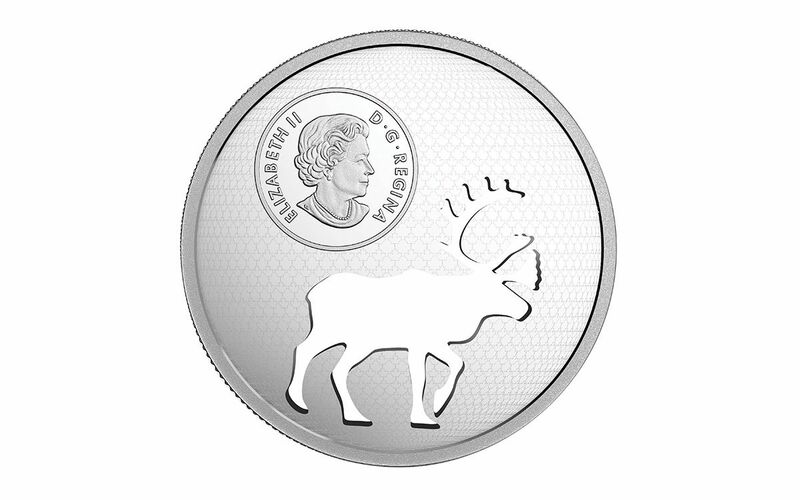 State-of-the-Art Minting Technology Reflects a Disappearing Wilderness Icon! The woodland caribou (or Rangifer tarandus caribou, to be more specific) is as much a part of the Canadian wild as freshly packed snow, craggy mountains and cold, clear streams. However, this instantly recognizable mammal is vanishing at an alarming rate. In fact, the Southern Mountain population of caribou is officially listed as "threatened" on Canada's Species at Risk Act (SARA) -- a warning that the total disappearance of this iconic species is far from impossible. 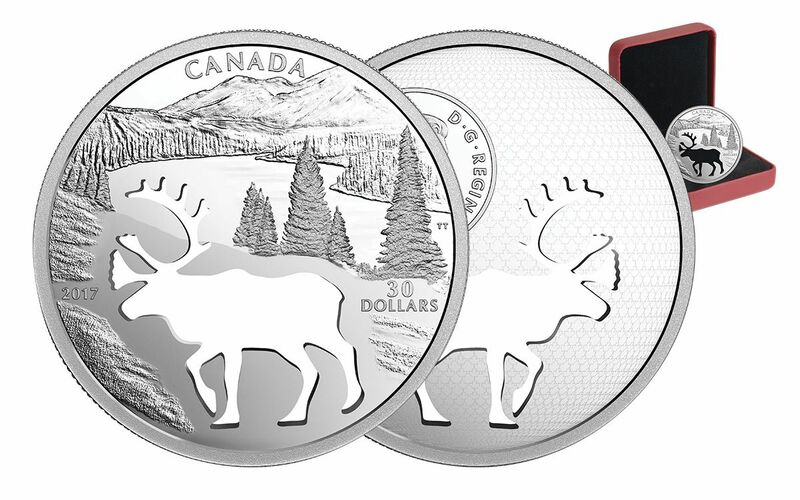 Now, the Royal Canadian Mint is employing the latest in minting technology to make a stunning artistic statement about the future of Canadian's at-risk wildlife with this gorgeous 2017 Endangered Animal Cutout: Woodland Caribou Proof. The first in a series of proofs calling attention to Canada's endangered species, this legal tender 30 dollar Canadian coin depicts a lushly detailed clearing of riverside forest in the shadow of a mountain range -- all on a large 54 mm diameter canvas. 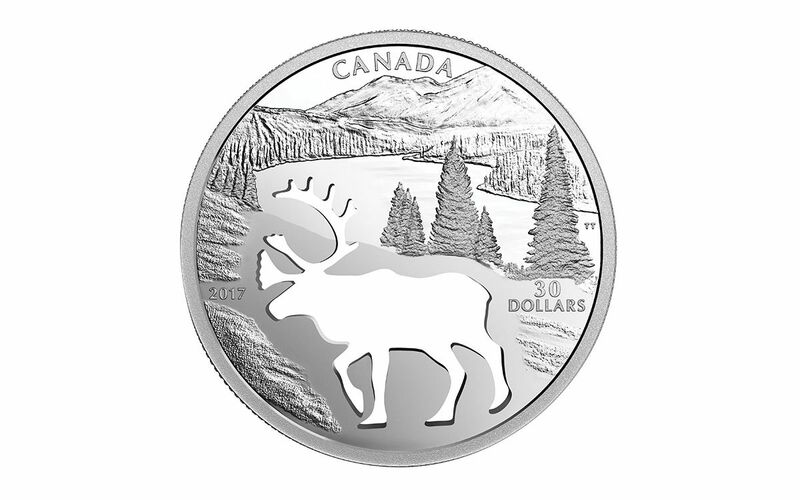 Literally, the only thing missing is a woodland caribou, instead represented by its distinct silhouette, smoothly cut out of the coin. What remains is a proof that is still 1.7 ounces of 99.99% pure silver, yet makes a somber observation of the beauty and diversity at stake. Created by Trevor Tennant, this phenomenal design is accompanied on the other side of the proof by an intricate repeating maple leaf design along with Susanna Blunt's portrait of Her Majesty Queen Elizabeth II. Your proof will arrive to you encased in a protective acrylic capsule inside a maroon clamshell within a black beauty box -- all with Royal Canadian Mint branding and a numbered certificate of authenticity. This superb proof has a markedly low mintage -- only 5,500 will be produced by the Royal Canadian Mint. This series first is already commanding attention among collectors, and subsequent proofs are already being hotly anticipated. Make your move now and bring this 2017 Endangered Animal Cutout: Woodland Caribou Proof before they're gone for good!